Fancy a cold beer? If you find yourself in the Palmetto State, you’re in luck. South Carolina hosts an epic statewide beer-brewing community that suits every palate. Take a tour—and a taste—at these 10 best breweries in South Carolina. You’ll need to book your tour ahead of time, but you can stop by the tasting room whenever your taste buds need a frothy cold treat. Thomas Creek Brewery offers the gamut of flavors, from IPAs to Chocolate Stout to high gravity concoctions and their flagship Red Ale. While you’re there, you can pick up supplies or complete kits for your own home brewing experience. Don’t let the name fool you—there’s no beard required to join the adventure at The Frothy Beard Brewing Company. Founded by three friends with a passion for beer, they’ve created some tasty blends that pay homage to Charleston and other parts of South Carolina. Try the Holy Water, named for Charleston’s Holy City moniker, or the Tiger’s Blood, a citrusy IPA dedicated to none other than the Clemson Tigers. It’s craft brew at its finest at River Dog Brewing Company. Here you’ll find unique flavors like pumpkin spice, coffee and chocolate, along with more classic flavors like their pilsner and IPA. Naturally, with a name like River Dog, you can expect a dog friendly experience. They can even serve up an ice-cold water bowl as you enjoy an ice cold beer with your canine friend on the patio. There’s a reason why this brewery was voted Best in the Upstate—with a background in classic German brewing, their owner and brewmaster knows how to do beer right. 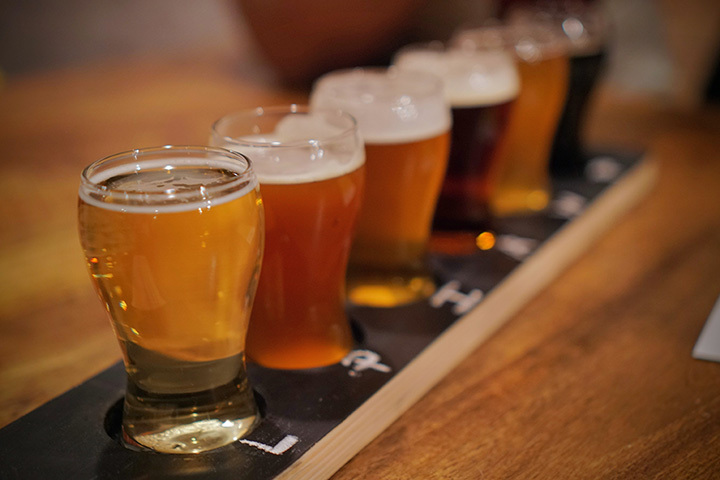 With award-winning ales and IPAs on tap, you’re sure to find a flavor that suits your tastes. Adding to downtown Greenville’s exquisite foodie scene, Quest Brewing Company offers a premium selection of fine brews to sate well-rounded palettes. One thing that makes them unique is their approach to sustainability and the local economy. The folks at Quest strive to minimize their carbon footprint on the environment, while sourcing materials locally whenever possible. Good beer, AND a sense of community? Sign us up. Some folks never leave Myrtle Beach without a little souvenir, but you can skip the beachwear stores and pick up your take-home goodies with some truly local flavors from New South Brewing. If you don’t want to schedule a tour, you can find many of their brews in restaurants and stores along the Grand Strand. Family owned? Organic? Locally sourced ingredients? Yes, to all. The folks at Coast Brewing Company take their craft very seriously, and it shows in their seriously good selection of fine brews. They have made it their mission to produce high quality, organic beer that can suit even the simplest of tastes. There’s a lot that goes into making the perfect beer, but the folks at Palmetto Brewing Company believe some of the most important ingredients are thought, passion, and care. And those ingredients, along with other fine elements, have created one of the best beer selections in the Carolinas. Their brews span the color spectrum to satisfy every taste, and you can sample them all in the tap room. At Conquest Brewing Company, beer is just that—a conquest. It’s more than a beverage. Beer represents a journey, one that’s been taken for many centuries by beer enthusiasts of every stature. You can continue this tradition of excellence when you join the fun in their tasting room and write the history of your own unique conquest. Don’t have time to stop in for a cold one? You can find many of their brews in stores and restaurants throughout the local area. Beer or food? Life’s full of hard choices, but at Upstate Craft Beer Co., you can satisfy both your cravings. This brewpub features some of the best (and local) craft beers you can get, along with a savory menu. And no worries if you can’t find a beer you like—just brew your own, right there on site. Yep, you can create your own concoction while consulting with a professional brewmaster, using professional equipment, and possibly discovering your life’s new calling. But make sure you book an appointment if you choose the U-Brew route—it’s quite popular among the beer community and stays booked for months! View more South Carolina Breweries and Brew Pubs.